Great choice, Phil. This is hands-down my favorite Faulkner novel, and probably has to be in my top ten list of Excellent Novels. 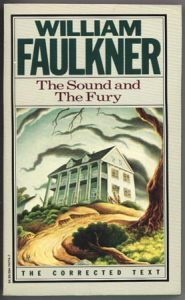 Faulker’s one of my favorite authors and i’d recommend almost anything he wrote. Though i must confess that _Absalom, Absalom!_ is an absolute slog and chore to get through, even though it is a great story. I still have vivid memories of my friend/roommate (who was also taking the Faulker class) and i getting so frustrated with that one that when we finally finished it, we simultaneously threw our copies of the book across the room, as if they were some horrible beast that we needed to flee from. I guess you know that one already (or have at least heard about it), but what imediately comes to mind ist “Clockwork Orange” from Anthony Burgess. The novel is written from the POV of the main character Alex, a teenager, who talks in an invented youth-slang. Many things have different names in that slang, which makes the beginning of the novel very hard to read – as it is intended by the author, I’m sure. I revently reread the book after more than ten years, and as I read through the novel the slang became easier and easier to understand. Simply by exposing yourself to it you get accustomed to the writing. It was fascinating to me that it worked that way.